is having delicious and fresh fish and seafood right at hand. Penn Cove Mussels are those to which all others are compared when it comes to taste! Harvested by Penn Cove Shellfish in Coupeville, Washington on Whidbey Island. So very yummy - there are no other words to describe this delicacy. Being a Northwest girl now, I have an arsenal of recipes featuring these little devils. One of my husband's favorites is Mussels in a Spicy Tomato Sauce simply served with crusty bread to sop up the juice and a glass of red wine. Add to it a beautiful pink & purple sunset over the water and past the mountains and you have heaven on earth. Simple ingredients mostly available in your pantry. Cook and serve in a paella pan - very festive. 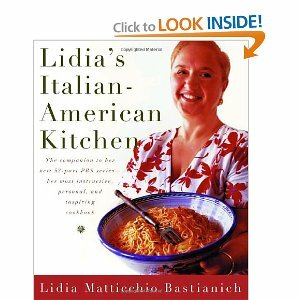 The recipe I use is from one of Lidia's cookbooks. dined in my mother's kitchen). shows on the PBS channel. This is my dear dad eating his second bowl of spicy mussels. He had three bowls in total (over 4 pounds)! give the cook is to ask for seconds and especially thirds!! 1. Clean and debeard mussels as needed. 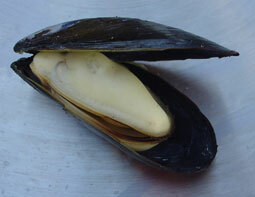 Remember to discard any mussels that are not closed shut or do not close when tapped. 2. Heat olive oil in a large skillet - a paella pan is perfect for this dish and presents nicely on the table. Add garlic and cook, shaking the pan until golden (about 3 minutes). Slide the tomatoes into the skillet and stir in the oregano and red pepper. Cook, stirring, until the tomatoes have cooked down (about 5 minutes). 3. Stir the mussels into the skillet, then pour in the wine. Bring to a boil, cover the pot, and cook just until the mussels are opened (about 3-5 minutes). Do not overcook or the mussels will be tough. 4. Stir in the basil. Add salt to taste. 5. 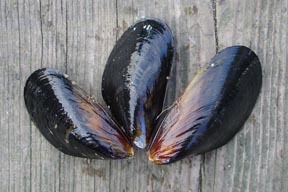 Discard any mussels with unopened shells. Serve with crusty bread to sop up the juice. I can hear my grandmother's voice still ringing in my ears. "Tutti a tavola a mangiare! Mangia! Mangia!"